Oak trees are generally harvested when they are about 80 years old and can be transformed into elegant structural features bringing a lots of character into your home. There are three different types of oak beams available on the market, namely, green oak beams, air dried oak beams, and reclaimed oak beams. Although nowadays the term green oak is often used frequently in the wood industry, it is often misunderstood. Green oak beams are usually highly preferred by craftsmen. Green oak usually shrinks as it dries out, causing the joints to tighten up. The living oak wood still contains moisture in the cells of the timber. As milled green oak beams from recently felled trees dry out, they will crack and change colour. This gives them a familiar elegance that is frequently seen in oak framed buildings or extensions. Just like the name indicates, air dried oak beams are straight beams, which have been specially dried out by being exposed to air. The climatic conditions of the region, plus the airflow around them, are what determine the rate at which the beams dry. A constant and even flow of air should pass through the timber stack in order to increase the air drying rate. 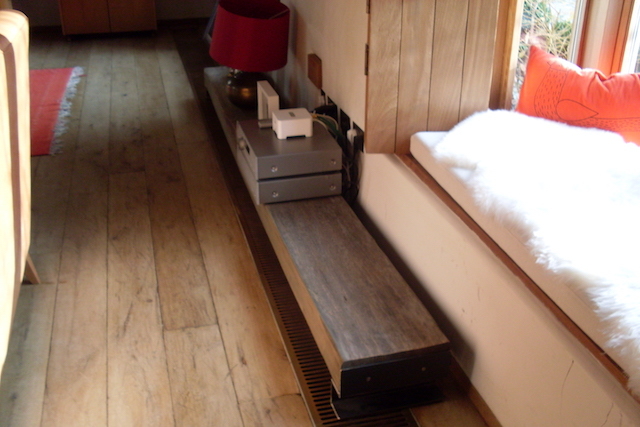 Since air dried oak beams have not been used before, they can be re-cut to specific sizes. The longer they have been air dried, the better. This makes them even more solid, and less inclined to additional movement and cracking. Air dried oak beams retain all of their natural features, including knots, splits, shakes and cracks which adds to their distinctive character. They provide uniformity of appearance, and, if necessary, some character can be added in the finishing process. Reclaimed oak beams are lengths of hard oak that have been salvaged from buildings intended to be used again. Since some of them could have been removed from barns, chateaux, old houses, and in some cases castles, these old beams have unique characteristics depending on their place of origin. There are some that are more than 200 years old. Each beam has knots, bangs, cracks, and scrapes that tell the story about their previous lives. The main advantage of reclaimed oak is its incredible strength. These beams are ideal for several situations since their stability helps in ensuring that there is minimum movement. If you are interested in discussing oak beams further, kindly get in touch with us.